“We never thought mom would walk again. The staff provided so much encouragement and assisted her in becoming more independent”. 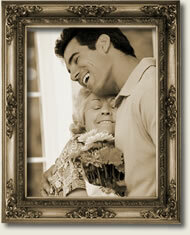 Memory Care is the term used for an option within the Long Term care continuum. The Memory Care environment is one that provides an option for those who no longer can live on their own and they do not need the intensive environment of a 24 hour Skilled Nursing Facility. Most Memory Care residents wish to maintain as much independence as possible while still obtaining a sense of security provided by available staff. Due to the memory impairments safety is one of the greatest needs for many living in Memory Care Communities. Most Memory Care Communities will have safety measures in place such as alarmed doors, delayed egress, wandering monitoring systems and staff trained to meet the special needs of those with memory impairment. Most Memory Care communities provide congregate living with apartment style rooms and common spaces for socialization, meals and activities. They normally provide meals within the common spaces and have choices to meet resident’s nutritional needs. Assistance with a variety of activities of daily living (ADL) is provided. A focus on the routine to assist the resident with memory care maintain independence is important when assisting with the daily needs and wants. Consistent life enrichment programming is an important need for residents in a Memory Care community. The environment of Memory Care communities vary but usually they strive for a very homelike environment within the décor and layout. Being knowledgeable in the choices that are available for seniors enables everyone to find the right amount of care in the least restrictive environment while providing opportunity for dignity while aging. Memory Care communities are a choice within the long-term care continuum. This option is for the individuals affected by Alzheimer’s and various forms of dementia that can impair memory and cognitive abilities. The impairments may negatively impact the individuals ability to adequately provide for their own safety awareness, hygiene, nutritional needs and medication management. These are only examples of the impact to life that can occur for those individuals with memory care needs. There are many resources that can assist you in gaining knowledge of the choices available to meet the unique needs of the individual with Alzheimer’s or another form of dementia.